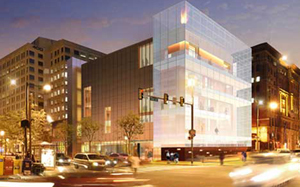 The new National Museum of Jewish American History opens in November 2010. It is dedicated to chronicling the American Jewish experience. Fritz Perls, psychotherapist, taught that people grow through skillful irritation. Such was my first reflection - after deep sadness – upon receiving a survey from the Museum of American Jewish History asking me to pick three nominees in each of several categories considered worthy of recognition for an upcoming museum exhibition. In total there were 218 Jews nominated. My sadness was due to a dearth of women appearing in the survey's offered options, although write-ins were invited. Women quickly complained, asking our communities to engage in write-ins. Some, like myself, initially sent letters until our own irritation grew at receiving a form letter back that didn't even acknowledge our issue. Some called to express concerns. I called to set up an interview as a journalist. First, the museum's Director Emerita Gwen Goodman assured me feminist scholars are involved in the planned exhibition and that women will be well-represented. The exhibition will include interactive computer technology where an infinite number of persons can be included in the data base. The survey, she explained, was ultimately determined by pollsters consulting to the marketing people. Besides, there's no commitment stated to basing the exhibition on the survey response. (Oh? It's just advisory? Then why did we do it at all?) And, she noted, the pollsters view it as an unusually successful survey. She told me it turned out to be "a real educational tool" because the professionals are surprised by how long those who took the survey spent reading the entries on each person listed. After that point she declared the discussion had become confidential. Gwen Goodman is so right, an Internet survey can reach more people than this physical Smithsonian affiliate museum's exhibition might ever draw. So the survey has served as more than a marketing tool, it is an important educational effort that has advanced world-wide the perception that women haven't been a major factor in Jewish history. After expressing this concern and requesting the museum do a tikkun (repair effort) on the survey, she said she'd call back the following week. Still waiting, but left a message so indicating. Now I am a disappointed fan of the Museum of American Jewish History. This institution was a great friend to Jewish herstory during my four year tenure as founding chair of the first program of Jewish women's studies at any institution of higher education, then known as The Jewish Women's Studies Project, at the Reconstructionist Rabbinical College. (The Project evolved into Kolot: Center for Jewish Women's and Gender Studies now under the skillful direction of Dr. Lori Lefkowitz.) The Jewish Women's Studies Project came into being when we were roughly a minyan of women rabbinical students in the late 1980s sitting in Helen Nakdimen's sukkah and contemplating why our dream of getting into rabbinical school was now "bringing us down," now that we were in. Rebecca Lillian verbalized the reason for all of us when she said, "I worked so hard to get women's studies accepted at my college, never dreaming there wouldn't be any here [in Rabbinic College]." The light bulb went off; we became animated and activated. The male students were virtually all instant allies. With a newsletter developed by Margot Stein and under the guidance of faculty member rabbis Reena Spicehandler and Linda Holtzman, we began to lobby faculty members with the goal of moving the project from an "outside the curriculum" student interest group to a formal program of the seminary. Before the matter came to a faculty vote, we baked and sold blintzes for months to raise money to bring in Dr. Judith Baskin as a consultant to help the faculty place women and children's lives and history into the curriculum. We also solicited and received funding from the Anna Frank Foundation to host an international juried art exhibition titled "New Images of Jewish Women's Leadership" hosted by the Y at Broad and Pine. As it turned out, ours would be the first all female class of rabbis to be ordained in American history, perhaps in world history. So we - Debra Cohen, Gail Diamond, Alexis Robert and yours truly, then known as Gail Milgram Beitman - organized to hold the ceremony at the Museum of American Jewish History. The museum again graciously provided its auspices, with the help of Margo Bloom, as it has for many of our Magnus lectures over the years. And the administrator who was opposed to the program at the seminary? According to Margot Stein, he later saw the lay of the land politically and agreed to help set up a chair for Jewish women's studies. That said, it was shocking for those of us who actually founded the Jewish Women's Studies Program to be sitting in the audience at a Kolot program about a decade later ignored, as he was called up to receive a plaque honoring his role in bringing Jewish Women and Gender Studies to the seminary.